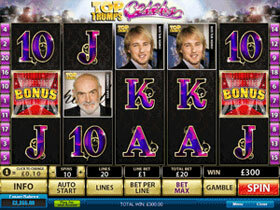 Top Trump Celebs from Playtech is a slot game with a difference, showcasing celebrities that include Madonna, Elvis, Johnny Depp, Nicolas Cage and Samuel L Jackson and many other very famous people. 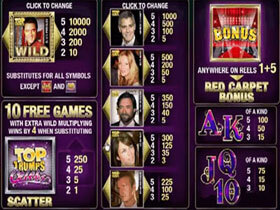 The difference in this game is that you choose which star celebrity you would want as your Wild. Simply follow the guidelines on the pay table and confirm your choice. Pay outs are 10,000 coins should you spin 5 of your chosen celebrities on an active pay line with a second prize of 2000 coins when you spin 4 Wilds. There is a bonus game which will kick in when you pull two of the bonus feature symbols on the first and last reel – you are then in line to win Free Spins and a win during the Free Spins comes with a 4x multiplier. 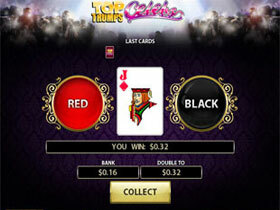 Players will enjoy this slot with winnings that can be very rewarding!